Dawa is from Bhutan, where he earned his BA Honours in English. Today, Dawa is Bhutan Broadcasting Service’s award-winning broadcaster and anchor who has had the unique opportunity of hosting the Presidential debates for two consecutive parliamentary elections in his country. He has also interviewed many important foreign nationals who have distinguished themselves in different areas of interest. In 2014, he was elected president of the Journalists Association of Bhutan. Considered to be one of the most reputable journalists in Bhutan, Dawa is held in high regard by people of all walks of life throughout the country. 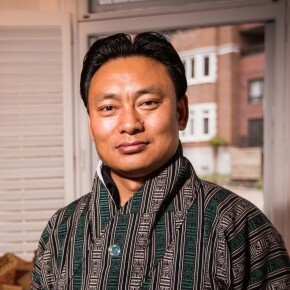 On his return from Canada following his time as a Sauvé Fellow, Dawa was given extensive responsibilities at Bhutan Broadcast Services (BBS) TV for producing three live weekly TV talk shows in Dzongkha, the national language, and in English. The shows treated a variety of different and largely controversial current issues. At the 1st Bhutanese Annual Media Award, in May 2009, Dawa received the best anchor award for his hosting of live debates and panel discussions on BBS TV. He was honoured in 2010 for the Best Programme of the Year on Governance and the Best Programme of the Year on Culture. Dawa’s interviews and debates can be accessed through the Bhutan Broadcast Services (BBS) website under two different titles namely “Dawai Kudreon” and “People’s Voice”. As as Fellow, Dawa undertook research on Gross National Happiness and the philosophy of development in Bhutan. Dawa returned to Sauvé House in November 2014 as a participant in the 2014 Sauvé Encore! Program and during his stay served as a member of the Alumni panel that followed the Jeanne Sauvé address by Mme Céline Galipeau.